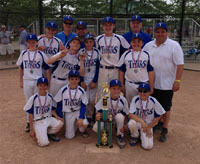 Description: 6th annual event which will be held at Flat Rock Community Sports Park. This is a Great tournament with an AWESOME quad of 4 diamonds with covered enclosed dugouts, concessions and clean bathrooms !! Very limited space for this tournament so register early. Sells out every season !! 14u thru 18u will play on the gorgeous college diamond home to the Collegiate League Michigan Monarchs and other local HS fields. Tournament could start Friday depending on amount of teams registered. Special Notes: Animals, alcohol and tobacco are prohibited. Gate fee will be charged. Only 1 team cooler is allowed. Hotel Booking Requirement for Overnight Teams: A good working relationship with hotels in our tournament destinations is critical for the long-term success of Wolves Tournaments. For this reason, teams who are traveling from out of town are required to book their hotel rooms through our Travel Partner to ensure that our room blocks are utilized since the hotels are holding rooms for our events. The team information page has an area to document hotel information for your team. Teams who choose not to work through this process may be assessed an additional $200 fee by Wolves Tournaments. PLEASE READ THE TOURNAMENT RULES AND INFORMATION PACKET POSTED ONLINE.